Sub-Lieutenant Emmanuel Oladipo Makinde stands behind Commodore J.E.A. Wey (left) and Major General J.T. 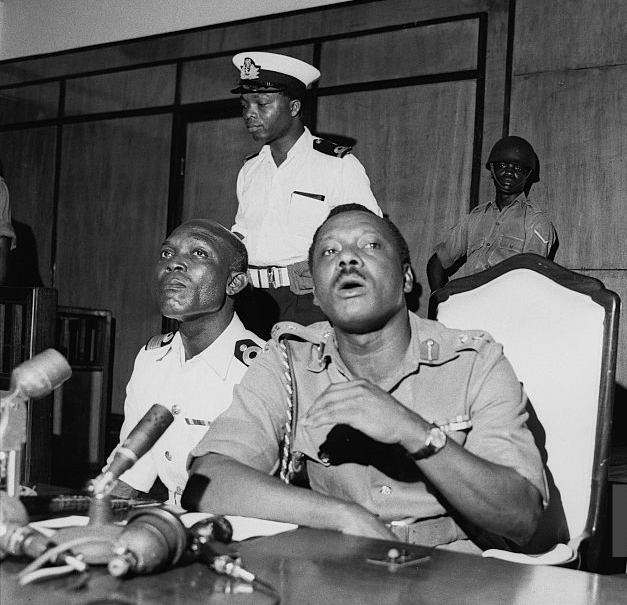 Aguiyi-Ironsi (speaking) at the first press conference of the Nigerian military regime established after the overthrow of the civilian government in January 1966. January 15th 1966 is a date that is indelibly etched into the national memory of Nigeria. Under the pretence of a military exercise codenamed ‘Exercise Damisa’, a young army major named Chukwuma Nzeogwu led a group of soldiers on a mission to eliminate leaders of the civilian government which had ruled Nigeria since it had gained its independence from Britain in 1960. In the Northern Region where he was based, Nzeogwu’s men assassinated the premier of the region at his home with the same occurring to the premier of the Western Region. In the then federal capital of Lagos, the prime minister was kidnapped and later murdered. The casualties were not limited to the political class. The mutineers also murdered senior military figures. Later in the day at 12 noon Radio Kaduna broadcasted a speech which Nzeogwu had drafted. Speaking in the name of what he styled the “Supreme Council of the revolution of the Nigerian Armed Forces”, Nzeogwu declared a state of martial law across the Northern Region. After, in his words, “acquainting” his listening audience with the ten proclamations in the Extraordinary Orders of the Day which the Supreme Military Council had promulgated, Nzeogwu gave a rationale for the severe action he and his men were taking. They are words which would have struck a chord among most of his countrymen who listened to it and those who would later read a transcript of his speech. Our enemies are the political profiteers, the swindlers, the men in high and low places that seek bribes and demand ten percent; those that seek to keep the country divided permanently so that they can remain in office...those that have corrupted our society and put the Nigerian political calendar back by their words and deeds. But the major and his fellow conspirators failed in their objective of securing the reins of power across the country. While the north was firmly in his control, his co-conspirators had not managed to secure the Western Region or Lagos. Little verging on nothing had happened in the Eastern Region. Into the vacuum created stepped in the surviving senior military officers. The General Officer Commanding the army, Major-General John T. Aguyi-Ironsi headed a meeting at police headquarters in Lagos among who were Commodore Joseph Wey, the head of the Nigerian Navy, and a number of army Lieutenant Colonels. They discussed a range of options including the restoration of civilian rule. This was eventually ruled out because many at the meeting came to the conclusion that such an action might have prompted another coup by soldiers who were against the largely unpopular civilian government including those who may not have been connected with Nzeogwu and his circle. The decision was made for the army to take over the governance of the country with its priority been to secure a formal transfer of power from the surviving political leaders to the military and the neutralisation of Nzeogwu who was threatening to march against them from the North. The former was accomplished when the civilian Vice-President Nwafor Orizu, after consulting with President Nnamdi Azikiwe who was abroad, broadcast the “voluntary” decision of the cabinet to transfer power to the armed forces. After a brief stand-off, Nzeogwu decided to subordinate himself to the authority of Ironsi and he agreed to be accompanied to Lagos where he was arrested. Ironsi formally established a Supreme Military Council on 17th January and Nigeria’s first republic officially came to an end. At the time of the mutiny, my father Emmanuel Oladipo Makinde had been serving in the Nigerian Navy for two years. He had previously served as an auditor for the Federal Ministry of Works before opting for a military career. He was commissioned as a sub-lieutenant and was soon appointed as the Flag Lieutenant to Commodore Wey. Flag Lieutenant is the naval style for what military services generically refer to as an aide-de-camp. In this role, my father served as Wey’s personal assistant and office administrator at naval headquarters. But during the heightened tensions following the mutiny, he appears to have also functioned as a bodyguard. For some years, I had been aware of the film footage below via grainy and truncated reproductions but did not make out that the naval figure wearing a holster with his service pistol half-drawn was my father. The news report by Britain’s Independent Television News (ITN) which reported the aftermath of mutiny captures scenes both inside and outside of the heavily guarded Parliament Building in Lagos where Ironsi gave his first press conference. At the 19 second-mark he is hovering at a checkpoint while soldiers question the occupants of a car attempting to enter the building. Then he can be seen liaising with army guards before turning around and giving a whiff of a smile in the direction of the camera when he realises that it is trained on him; this at the 25-26 second-mark. Later on, when the senior figures in the Supreme Military Council have arrived and are inside the building, the footage captures him standing behind Wey, hands on hips and turning his head from one side to another as Ironsi fields questions from a mix of local and foreign press correspondents; this at the 54 seconds-1 min. 7 second-mark. He is visible again at the 1:47-2:03 mark. While many in the Nigerian population initially welcomed the intervention of the military into the sphere of governance, Nzeogwu’s attempted revolution succeeded in creating an atmosphere of mistrust among the ranks of the military and among the country’s multifarious ethnic groups. It would lead to a brutally contested thirty-month long civil war and military rule for twenty-nine of the thirty-three year period which followed. The majority of the conspirators in the mutiny including Major Nzeogwu himself were ethnic Igbos. The fact that the overwhelming number of victims in the purge hailed from the north and the west of the country led many to believe that the coup had been tribally motivated. While General Ironsi, himself an Igbo, had not been privy to the coup, certain policies and certain decisions which he would go on to make were interpreted as favouring his kinsmen. His indecision about how to deal with Nzeogwu and his co-conspirators who were held in various prisons, his approval of a number of promotions within the army and finally his Unification Decree of May 24 1966 which altered Nigeria’s federal system to a unitary one all contributed to the concatenation of violence which spiraled into an armed conflict. In May of 1966, a pogrom was directed at Igbo residents in the north. Then on July 29 1966, a second mutiny this time engineered by officers from the Northern Region targeted their mainly Igbo comrades for assassination and a series of summary executions were carried out. Major-General Ironsi met a gruesome fate while on a national tour. He was assassinated in the city of Ibadan, capital of the Western region. The man who emerged as the head of state was Lieutenant-Colonel Yakubu Gowon, a Christian from the largely Muslim north. However, the military governor of the largely Igbo Eastern Region, Lt. Colonel Odumegwu Ojukwu refused to accept Gowon’s authority. A further massacre of Igbo residents in the north in September of 1966 did not help the situation and Nigeria, the creation of imperial draughtsmen, appeared on the brink of splitting into its component parts. In an attempt to forestall this, the military ruler of Ghana, General Joseph Ankrah invited Gowon, Ojukwu and other members of the Nigerian Supreme Military Council to the city of Aburi for a peace conference held between the 4th and 5th of January 1967. Commodore Wey was one of the invited figures and my father, now a Lieutenant, accompanied him to Ghana. While Wey’s square-jawed, focused demeanour suggested the quintessentially stiff upper lipped military sort, he also had a gregarious and humourous side which he was often prone to display. My father told a story about how Gowon and the rest of the military governors including Ojukwu were sitting at the conference table waiting for their host-mediator, Ankrah to enter the room to start the talks. As they sat in awkward silence, Wey decided to break the ice. He brought out a large comb and while remaining poker-faced began stroking his bald pate. Ojukwu, who had maintained an air of solemnity and circumspect silence, joined in the ensuing laughter. The following archival footage of the aftermath of the Aburi Conference captures my father looking on in the background as Colonels Gowon and Ojukwu toast each other. He can be seen third from right from 0.22 to 0.30. One of the issues of the Aburi conference concerned the fate of Major-General Ironsi. That he had been kidnapped and murdered by dissident soldiers just over five months earlier was beyond doubt. The problem was that the succeeding administration led by Gowon had made no reference to this fact and Ojukwu demanded that his death be formally announced to the Nigerian public. An announcement was soon made to Nigerians and Ironsi’s remains were exhumed from the military cemetery in Ibadan and transported to Umuahia, his hometown in the Eastern Region. Commodore Wey led the delegation sent to represent the federal government and once again my father accompanied him and witnessed the funeral. While the positive immediate aftermath of the Aburi Conference had raised hopes for a peaceful outcome to the crisis in Nigeria, the catastrophe which it had sought to avoid would come to fruition. The Eastern Region formally declared its secession from Nigeria on 30th May 1967. A “police action” mounted by the federal government did not succeed in dismantling the rebel state of Biafra and so a full-blown a civil war followed which cost the lives of millions. The war officially ended on January 15th 1970, precisely four years after the fateful mutiny led by Major Nzeogwu. My father continued his professional relationship with Commodore Wey who was promoted to Rear Admiral in 1967. Wey became the acting foreign minister which meant that my father accompanied him on trips to destinations that including the Vatican. The purpose of these travels was to drum up international support for the federal government’s prosecution of the civil war. After the war, my father was promoted to the rank of Lieutenant Commander in 1970. He was appointed as the Deputy-Defence Adviser at the Nigerian High Commission in London, a position he held between 1971 and 1973. During this period he worked with Murtala Mohammed, a future head of state who had led the second mutiny of 1966, during Mohammed’s tenure as High Commissioner. He was promoted to Commander soon after his return to Nigeria and served as head of supply and secretariat, alternating his base of operations between the Ministry of Defence building in Marina Lagos and the base of the Western Naval Command in Lagos’ Apapa district. He would later become the director of naval logistics. He retired voluntarily in 1982 having attained the rank of Captain.